CRM Plugin Code Structure – By functionality or by event? When we work on CRM plugins, there is a key decision at the beginning of the development cycle when it comes to structuring your plugin code. There are two main ways of writing your plugins : by events or by functionality. In this post, I will describe the two approaches and discuss some of their pros and cons. Plugins can be described as handlers for events fired by Microsoft Dynamics CRM (source). There can be multiple handlers for single events. Let’s use an example for the purpose of this post. For the event, we’ll use the creation of a case (pre operation). We will consider that when the case is created, there are two actions that need to be performed : generate and assign a unique case number and validate that required fields have authorized values in them. 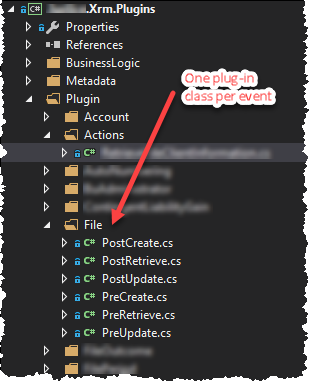 For the plugin structure based on event, it means we’ll have a single plugin registered on the Case Pre create event, and inside the plugin class we’ll have two business logic blocks of code to execute (one to generate the unique number, the validate the required fields). In this case, we’ll have two plugin classes registered on the same event (again, one plugin for unique number generation and another to validate the required fields) – Sorry, no screen shot here but you get the idea . So which model should you use? I have used both models heavily on various occasions. For me personally, the decision on which one to use comes down to a project’s needs and a coding style preference. As an example, if you know you’ll have a lot of generic features and want to have reusable plugins, you are better off using the functionality based model. The same applies if you know there are processes that require to disable specific functionality on a regular basic. On the other hand, if you project is relatively small and includes simple business logic on a few events, the event based approach can be a good choice. Feel free to add feedback in the comment section if you see other pros and cons for each of these models or want to share experience in the area. A common requirement in CRM implementations is the need to have readable identification numbers auto-generated for custom attributes. There are various ways of achieving this. This article provides a few options to do that. Let’s use one scenario as a context. Let’s say we are building a Grants Management application and we are tracking scholarship applications in Dynamics CRM. We have an application entity which contains an Application Id field. For business reasons, we need to have a unique identifier to refer to the applications. What are out options? For starters, let’s look at some of the elements to consider when looking for an auto-numbering solution in Dynamics CRM? Do you need the numbers to be sequential? Do the auto-numbers need to be human readable? Can you and/or do you want to write code to generate these numbers or do you want an simple configurable solution? Of course, this required a plugin on an event that will generate the application Id. From a technical standpoint, there are a few algorithms out there that will give you an indication as to how this can be done. The full date time and the “tick” should be use to generate the number to ensure uniqueness. But even with that, there is a very very very small chance of having race conditions depending on your application and on your (bad) luck. Also, this will not allow your to use sequential numbers. If you are *not* using one of the CRM auto-numbering enabled entities (for example, Campaign), this solution is have a plugin (or a Workflow) on your triggering event that will create a Campaign record. This campaign will automatically be assigned a unique number based on your CRM configuration (image below). You can re-use that number as the unique ID for your record and delete the Campaign record that was created. While this is a simple method that can be implemented without coding, the numbers are not really sequential, “garbage” records are created at a cost (create/delete transactions time, what happens if you want/need to use that entity in the future?..). To be honest, it feels like a quick-and-dirty way of doing things, but it works. The advantage here is that because the auto-numbers are platform generated, so you do not have to worry about race conditions in theory. Bottom line, this is a great solution if you cannot write any code and don’t want to spend any money for something that should be standard in the platform (yes, I’m ranting, can’t help it). That being said, it you have race conditions, I’m sure you can have a few duplicated numbers with this solution. There are plenty of options out there. Some are more flexible than others. Some explicitly guarantee uniqueness, some don’t really mention it. Some are free, some are not. These are just a few, a research will allow you find more of these and decide the one that fits your needs the best. At this point, you can do it anyway you want. There is also a smart way of doing robust auto-numbering suggested by Ken Heiman of Green Beacon here. Good read, smart idea. I have also seen the idea of using the Guid as a unique identifier, by copying the value into a text field with a plugin. I don’t think it’s readable, but definitely unique. It had been too long. Happy CRM’ing ! Today I had to work on a solution that I hadn’t touch in a while. It was built with Visual Studio 2012 using the CRM Developer Toolkit. Since I made the decision not to use it, I needed to find a way to use the solution with Visual Studio 2015 without having to recreate one. Create a new project (I usually use a library, empty project). For the Plugin or Custom Workflow activities project types, it is also simple enough. 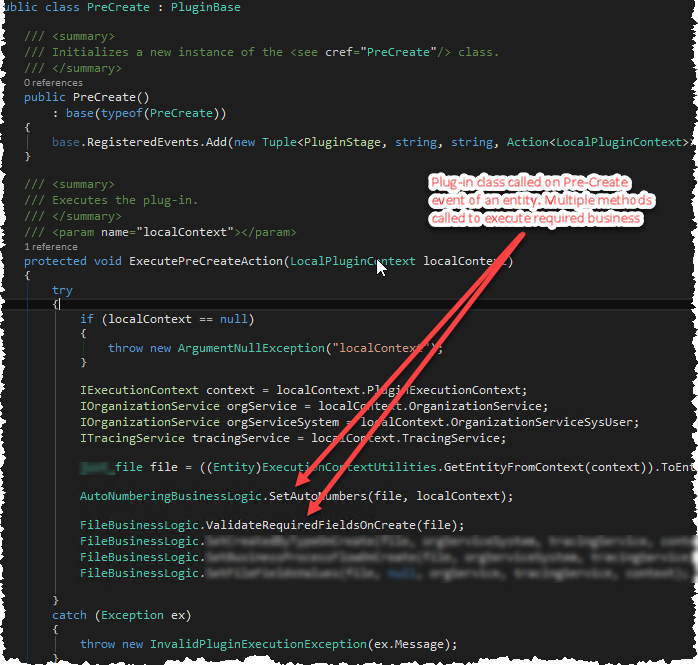 If you open the solution in VS2013 or VS2015, you will see that the project is flagged as not compatible. To fix this, a small operation is required. Find the location of the project on the computer and open the corresponding project file (.csproj) and open it with a text editor. Once open, find the “ProjectTypeGuids” node under the Project –> PropertyGroup node and delete it. Again, close the solution and re-open it, It should work like charm! Life is good.